This wearable, vibrating, silent metronome helps you keep time without that distracting tick-tock sound. Let the distracting tick-tock metronomes of the past stay there—there's a new, more intuitive option. Now, you can literally feel the beat. 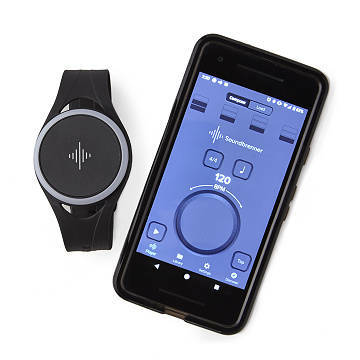 This modern update is powered by vibrations seven times more powerful than the average smart phone, and is made to wear wherever's most comfortable for you—around your wrist, upper arm, or ankle—so that you can keep time based on its silent pulsations. Simply turn the outer wheel to adjust the tempo and twist the control to change songs in your rhythm library. You can even synch up with your bandmates, so get ready to rock out—more precisely than ever. Made in China.